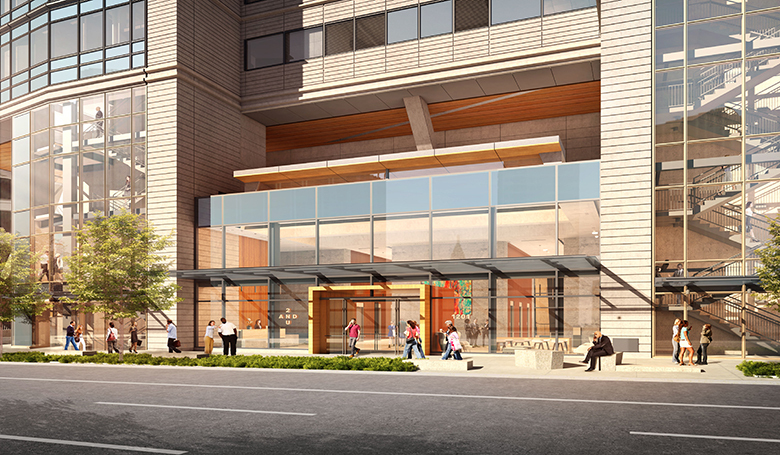 Rendering of 2+U Tower's Second Avenue lobby entry. Tech company Dropbox Inc., a file sharing and data-storage company based in San Francisco, has inked a deal to lease four floors, a total of 120,886 square feet, in the 38-story 2+U Tower now under construction in downtown Seattle at Second Avenue and University Street, near the Seattle Art Museum and Benaroya Hall. The 686,000-square-foot Class A office tower, which is being developed by global development and construction company Skanska, also will include some 17,000 square feet of local retail and arts and cultural space as well as a rooftop deck and fitness and wellness space. Dropbox is expected to occupy the office tower, four floors in total, in late 2020. With the lease, the 2+U Tower is now 60 percent leased, with other tenants including online employment-search company Indeed.com and coworking company Spaces. Construction of the office tower is slated for completion in about four months. Other Seattle-area office-building developments by Skanska include Stone34, which is the global headquarters for Brooks Sports; and 400 Fairview, with tenants Tommy Bahama, Impinj and Car Toy’s/Wireless Advocates.